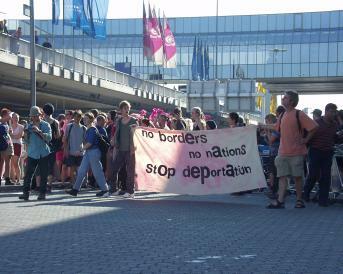 1500 border-campers demonstrate against deportations and against the immigrant detention center at the Frankfurt airport. 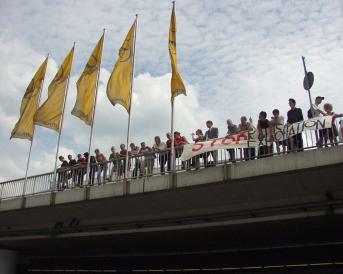 29.Jul.01 - This weekend the start of the fourth antiracist bordercamp of kein mensch ist illegalwas marked by demonstrations and actions in Frankfurt. On Saturday an opening event, that included theatre shows, speeches and the distribution of the camp newspaper took place in front of the city hall. The 500 participating campers demanded the closure of the immigrant detention center C182 on the grounds of the Frankfurt airport as well as open borders and free immigration for everyone. Afterwards the protestors went to the Italian consulate in order to protest against the criminalization of the protests that took place in genova last weekend . The activists demanded the release of the 25 publixtheatre-caravan activists that were arrested outside genova while on their way to the frankfurt bordercamp. They are currently in now in imprisonment of remand on charges of being members of a terrorist organization that instigated the riots that took place during the demonstrations against the G8 meeting. Sunday the first action at the Airport took place. About 1500 activists highlighted the daily routine of deportations carried out by Airline companies such as Lufthansa, Air Bosna, Tarom and many others. 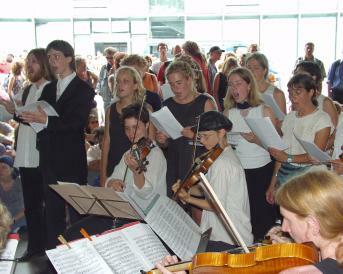 There was a classical concert, banners and posters were displayed and in spite of a prohibition of the Airport authorities that was enforced by a massive police contingent, the activists forced the authorities to allow a demonstration inside of terminal 1c by blocking the streets towards the departure zone for some time and by a number of smaller actins inside the terminal buildings.